WANTED: LASERS DEAD or ALIVE! HHR Lasers, Inc. will buy your used, damaged or inoperable lasers, psus and accessories, so we can process them into some of the best refurbished lasers in the industry. Coherent I-100 Coherent I-100 Argon with sagging cathode, PSU works. Sold as is. 3/25/00 $1,000. + shpg. Spectra Physics 2560 PSU Spectra Physics 2560 PSU with 85 hours on it. Working conditon unknown. PSU only. 60 amps max with adjustable magnetic field regulator. 208 v 3 ph, H2O cooling. Phase sensative. $400.00 + shpg. MONTHLY SPECIAL: Name your price! This months special: Name your price! No reasonable offer refused for service, refurbs and complete laser systems. Does not apply to New DPSS lasers or existing customers. Mgmt retains the right of refusal. ????? At HHR, we completely rebuild our units using only new or remanufactured components. 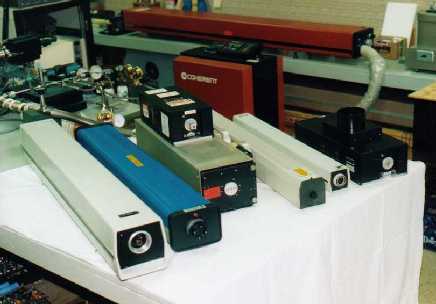 All laser platforms are upgraded from A to B models, or the latest models when possible. Even our paint colors are computer-matched. New laser tubes (manufactured on-site or procured off-site) are guaranteed for 12 months pro rata. There's also a 90-day warranty on electronics. And, of course, tech support comes included with all our products. All units currently featured in our inventory below meet or exceed original specifications unless otherwise stated. If you don't see the model you're interested in, either visit our Laser FAQ page or simply e-mail us.